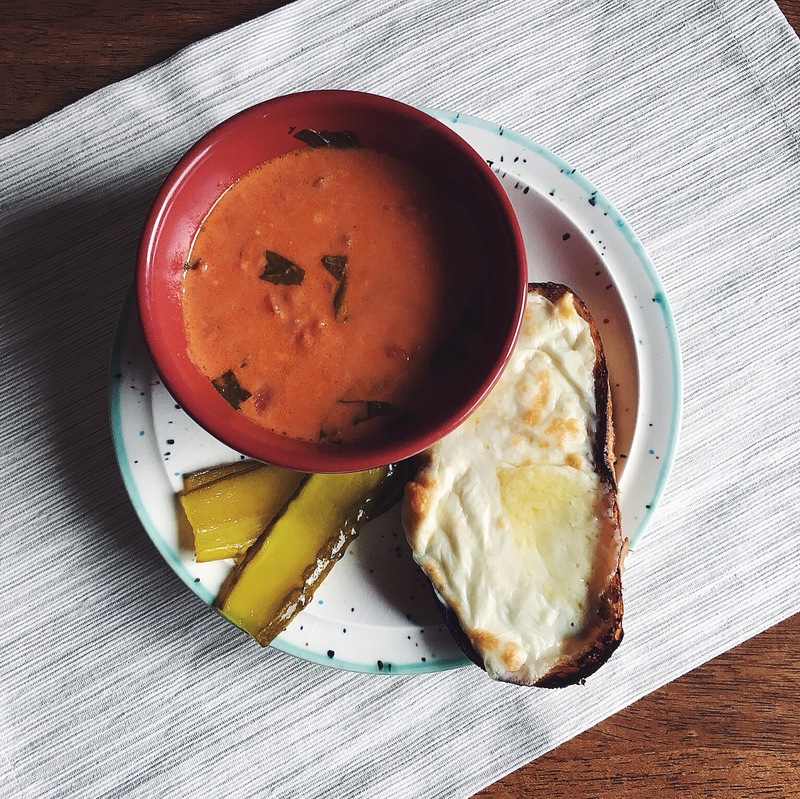 This simple satisfying meal of hot soup, crispy bread and cool crunchy pickles is one of my favorites these days. 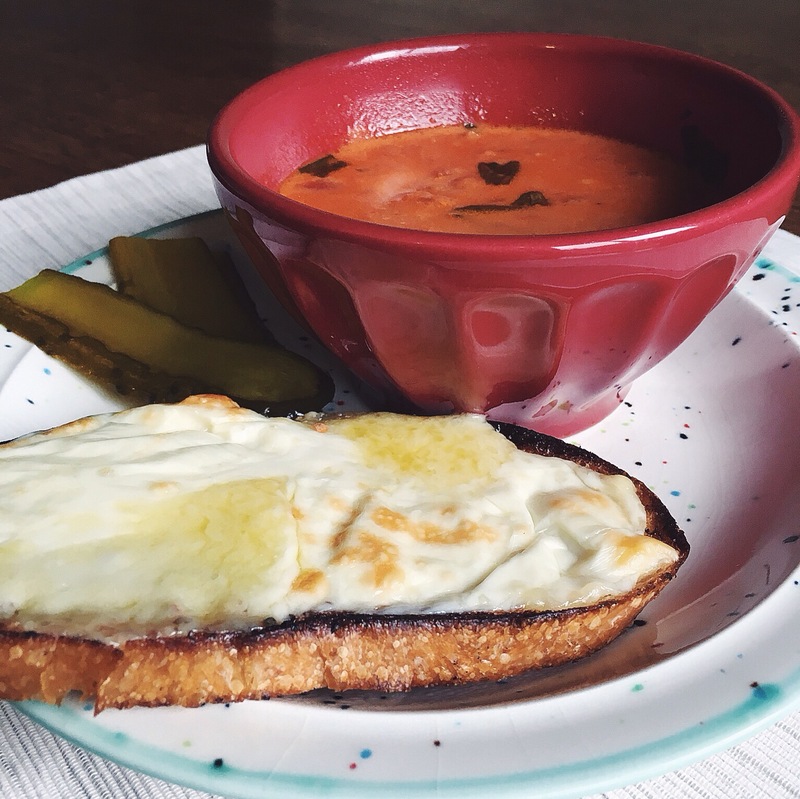 This week it is actually cold here in Moscow and I was not mentally prepared for 30s and 40s just yet, but here we are, and this meal has been making it feel very cozy. 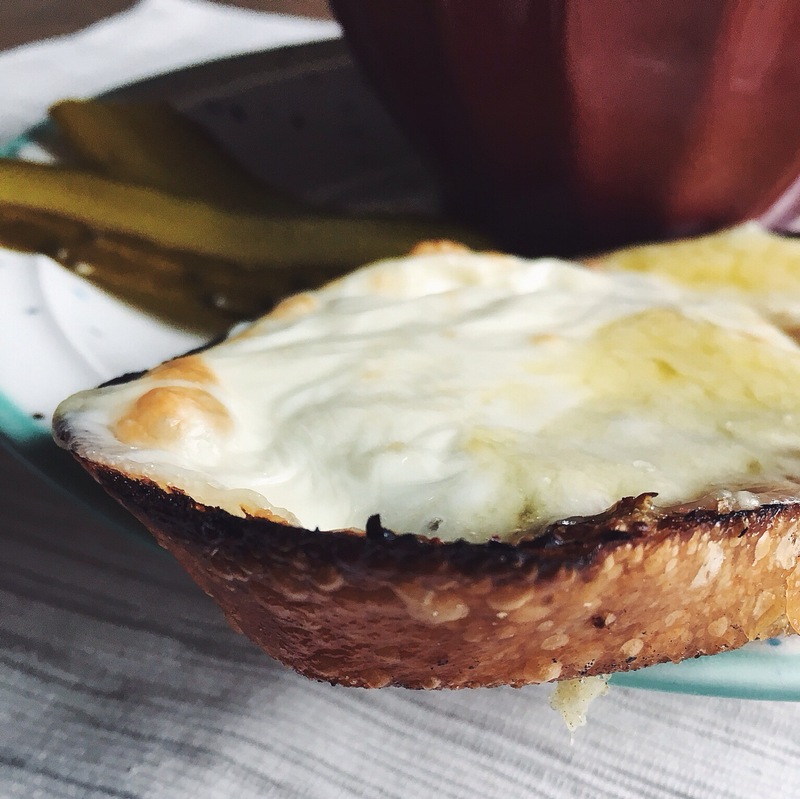 I’m sharing this open face grilled cheese with you because it is absolutely perfect – crispy, crunchy, cheesy, melty and buttery with a touch of tang from some stone ground dijon hidden underneath all that cheese. 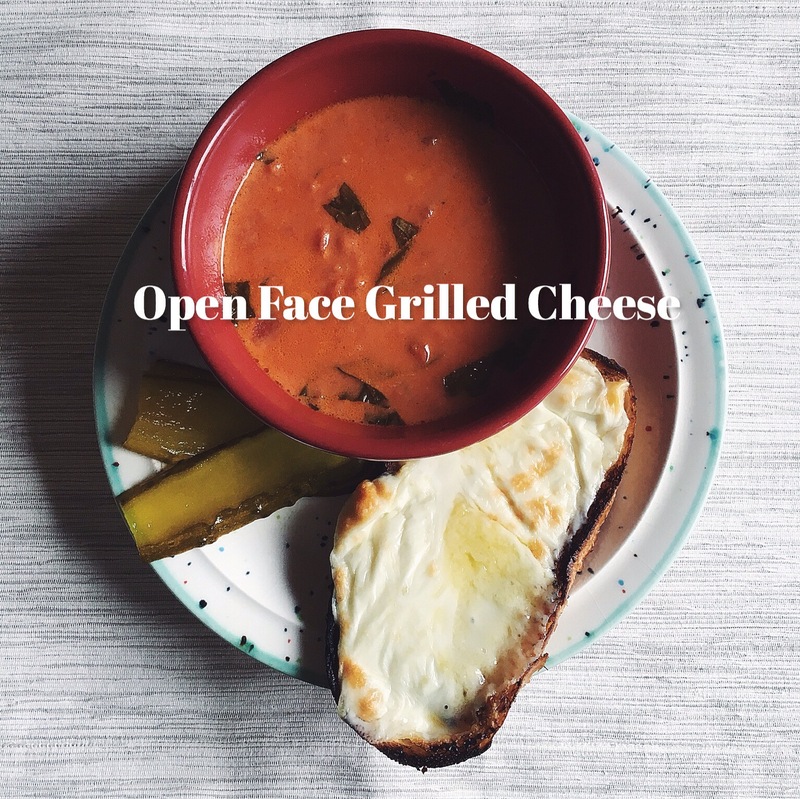 If you’re into these types of things, then you’ll be all about this grilled cheese, whether you eat it on its own or use it for dipping in your favorite soups. Over this past summer Eric and I took a trip to San Francisco for a Giants game and on our last day there we went and checked out the Ferry Building where there’s cute artisan shops and great places to grab a quick meal. This is where I first came across the open face grilled cheese I’m recreating here, at the Sidekick Cafe & Milk Bar where we stopped to grab a bite to eat. I didn’t quite know what I was going to get when I ordered this “cheese toasty” but while waiting in line I met a man who said he and his wife take the train up from the south bay once a week to eat these so called “cheese toasties” and I knew I was in for something especially mouth watering. Needless to say it was delicious, worth remembering and worth recreating here to share with you. This is not your ordinary grilled cheese with white bread and american cheese. This can be made in so many different variations – mozarella with fresh basil leaves, apricot jelly and aged white cheddar, gruyere and bacon bits.. it’s truly endless. Turn oven broiler on high. Heat a non-stick oven-safe skillet** on medium heat on a burner. Spread the slice of bread with butter on both sides and place on skillet. Once the first side is slightly browned flip and let other side begin to brown. Squirt desired amount of dijon onto browned side of bread, spreading over entire surface and layer with cheese slices. Place the pan with the bread on the top rack of the oven and broil for 3-5 minutes, keeping a close eye on it. 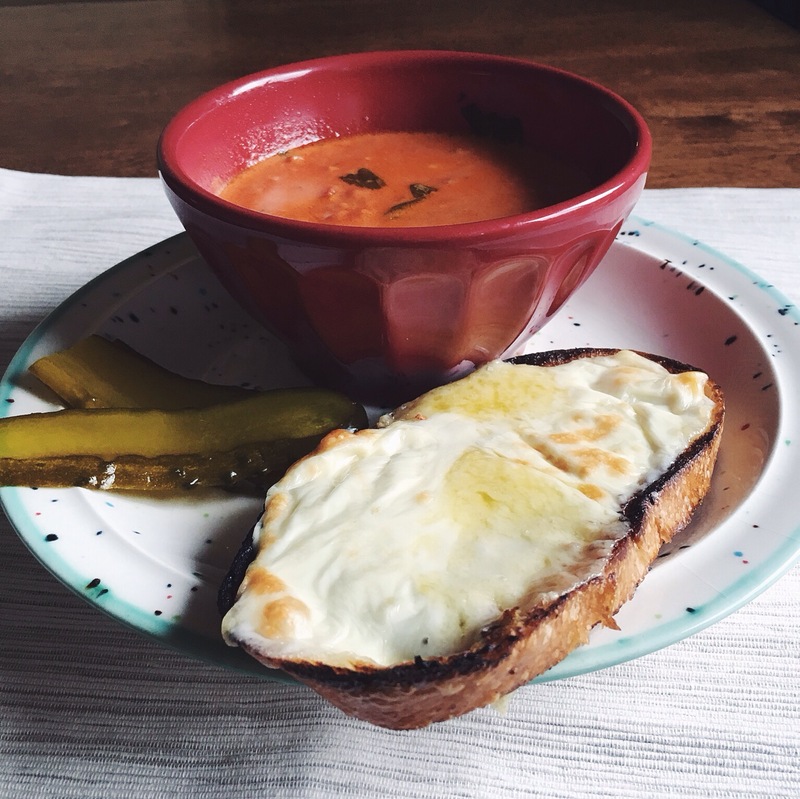 You’ll want to remove once the cheese is melted, bubbling and edges of bread are crusty brown. Enjoy immediately on its own or dipped in soup, be careful the cheese will be very hot. **I used a cast iron skillet, but if your skillet isn’t oven-safe you could transfer your bread to a baking sheet prior to putting it in the oven. These were soooo yummy. I will need to recreate this again! !